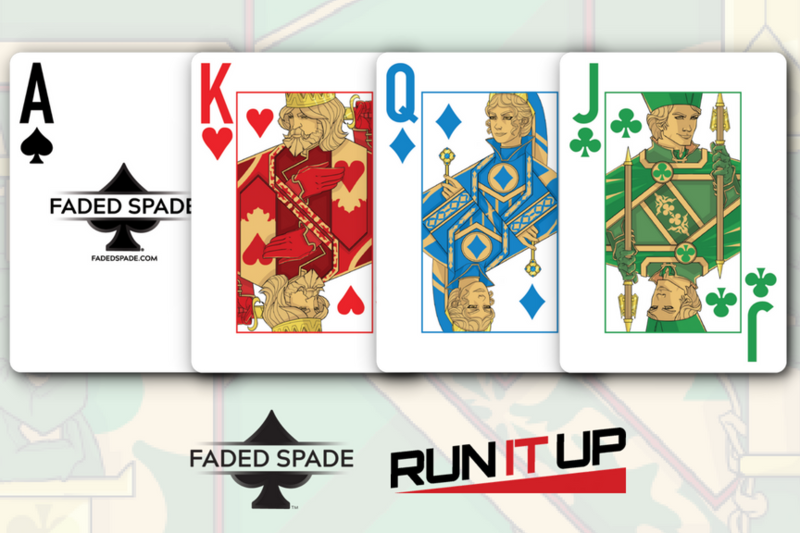 We're excited to announce that Run It Up is a Faded Spade 4Color playing card customer and partner! And we're big fans of Jason Somerville & his vision for four-color cards at live events like Run It Up Reno & via live poker streams on Twitch. "I’ve wanted to make a premium quality RIU four-color deck for years and it’s finally happened," said Jason Somerville. "Faded Spade has done an incredible job. These cards look sharp and feel great!" Run It Up card back four-color two deck sets are now available at the Run It Up Store, and our recently launched pure Faded Spade four-color card sets are available in the Faded Spade Store. "We believe in Jason's vision of four-color cards in the live game and live stream poker space," said Tom Wheaton, Founder & CEO of Faded Spade. "The entire Run It Up team has a deep passion for poker and enhancing the player experience. Our cultures are highly aligned in that regard, and together we will bring the on-line playing card experience on-felt!"